The Rev. Septimus Harding was, a few years since, a beneficed clergyman residing in the cathedral town of ––––; let us call it Barchester. Were we to name Wells or Salisbury, Exeter, Hereford, or Gloucester, it might be presumed that something personal was intended; and as this tale will refer mainly to the cathedral dignitaries of the town in question, we are anxious that no personality may be suspected. Let us presume that Barchester is a quiet town in the West of England, more remarkable for the beauty of its cathedral and the antiquity of its monuments than for any commercial prosperity; that the west end of Barchester is the cathedral close, and that the aristocracy of Barchester are the bishop, dean, and canons, with their respective wives and daughters. 2015 marks Anthony Trollope's Bicentenary and, following Audrey's lead, I have decided to read the six Barsetshire novels over the course of the year. The first installment, The Warden, was originally published in 1855 and is actually a reread for me. The book centers on the character of Mr. Harding, a clergyman of great personal integrity, whose charitable income far exceeds the purpose for which it was intended. Young John Bold turns his reforming zeal to exposing what he considers to be an abuse of privilege, despite being in love with Mr. Harding's daughter Eleanor. The novel was highly topical as a case regarding the misapplication of church funds was the scandalous subject of contemporary debate. But Trollope uses this specific case to explore and illuminate the universal complexities of human motivation and social morality. Oh! Yay!! It will be so nice to be with you on this journey. :) The Warden is a re-read for me, too, but I'm thinking that I want to remember who's who and what;s what before I go forward. Audrey - My thoughts, exactly. Thank you for inspiring me! Fun challenge! Trollope has been on my list of authors forever . . . maybe this year I will pay him a visit. I don't do so well with classics, but I hope you enjoy this one. I haven't read Trollope, but I feel as though I should. Yes, I've read many classics, but lately I tend to read a different kind of book. Thanks for sharing...and enjoy! And thanks for visiting my blog. Laurel-Rain Snow - I go in streaks with classics and have a feeling a new one is beginning. I like the humor in the opening. I would keep reading. You've got me curious. Literary Feline - I'm hoping to see more of that humor throughout the book. I haven't read Trollope. I'm really not much of a classics reader. Sounds interesting though. Yvonne - I've enjoyed quite a few classics over the last few years. I've never read anything by Trollope, but to be honest this opening is not grabbing my attention. Diane - I'm enjoying this book quite a bit! I actually really like this intro! And I don't normally feel that way about many classics! Will be interested to hear your thoughts. I loved The Barchester Chronicles. Last year I finally got around to reading Can You Forgive Her?, so this year I'm really hoping to finish most of the Pallisers series. And I'm I think I'm going to host a Trollope readalong in April, for the bicentenary of his birth! Not sure exactly what it will include, but I'll probably have links and some giveaways. Hope you'll join us! Karen K. - That sounds like fun! Mr Harding is one of my favourite characters. I really need to finish the Chronicles - I put Dr Thorne down over a year ago and still haven't got back to it. This is definitely the year to do it. Cat - I've already developed a soft spot for Mr. Harding. Maybe you'll pick up Dr. Thorne again when we get to it in May? Melissa - I was so sorry to miss your readalong last year. Glad to have this second chance! I have not read any Trollope much to my embarrassment. I look forward to seeing you talk about them over this year though so I'll have a good idea of where I want to start. This sounds like such a fun project! Katherine - That's certainly nothing to be embarrassed about. Hope you enjoy reading about the project. Thanks for doing this, JoAnn! I'm trying to get my reading mojo back, and this might just be the ticket. Looking forward to it! Sharon - It will be great to have you reading, too! I have not read any Trollope either, but have started picking up copies when I see them I think I have two of them now and of course you can get them free in ebook. I did watch the old BBC TV series The Pallisers and loved it! Splash in the ocean for me! Peggy Ann - I'm looking forward to exploring the BBC's Trollope offerings! Monica - I read SO many new releases last year and now seem to be swinging in the opposite direction. I had planned to read some of Trollope's standalone novels now I'm through with the Pallisers, but you're making Barsetshire very tempting. Jane - It would be great to have you join us. I'm also very tempted by the Forsyte readalong. Loved the first three novels and two interludes, and wonder if I can fit it in this year, too. 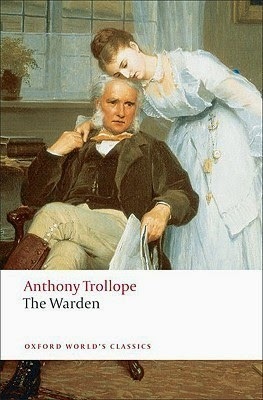 I don't think I have ever read Trollope, but for some reason he sounds very familiar. I will have to check his books out. Athira - I read The Warden more than a decade ago, but don't remember enjoying it as much as I am now. I haven't read this one ... I'll be waiting for your (re)thoughts. Beth F - Already liking it much more than I did the last time around. The series is new to me as well. The author's name rings a bell, but I don't remember what I've read. I don't know if I have time, but I'd love to read along. The book sounds charming. Margot - Trollope has written SO many books. This one is delightful so far. Christy - That would be great!